Hokkaido is an important agricultural area of Japan. The amount of arable land managed per farming household has been increasing because of the aging of farmers and the decreasing number of agricultural households. To improve labor productivity, increasing the size of paddy fields and developing groundwater-level control systems have been promoted in recent years. Hokkaido has a cool climate, so its rice cultivation season is shorter than elsewhere in Japan. To manage the expanded fields in the short work period, farmers have been making efforts to reduce labor and disperse the peaks of field work by shifting from conventional transplanting to direct seeding. The authors conducted surveys of the submerged water level, groundwater level, and amount of water intake at paddy fields in areas with large-scale paddy fields with pipeline systems or with open channel systems, and in areas with conventional small-scale paddy fields. 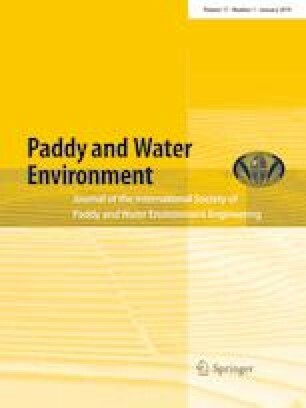 This study reports the results of comparisons between the characteristics of water management and water balance in an area with a pipeline system to those in an area with an open channel system.